The Moon is in Virgo until Thursday, April 26, 2018 at 9:13 PM EDT. The BIG NEWS today is Mercury square Saturn for the second time this month. The first time was on April 5, 2018, but this is actually the third time this year we are experiencing this aspect. The first time was on March 11, 2018. Gosh, aren't we all just getting a little tired of 'narrow mindedness'? Is it me or you? Is it us or them? Is it her or you? Is it him or you? It's probably THEY! 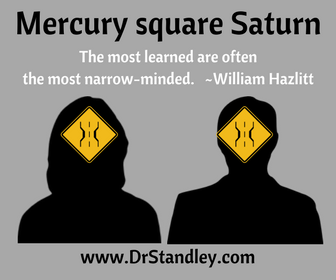 Mercury square Saturn is very rigid and strict that cannot seem to color outside of the lines. This is stuck energy that doesn't like to change, doesn't want to change and probably won't change. If this is you, then you are the problem. If this isn't you, then you get to change and rise. Those who do not want to change will either rise or fall to the wayside. This aspect gets hung up on details, and I mean THE MOST minor details that are simply unimportant. This causes one to get stuck, but then refusal to act on something or move forward is impossible. The detail is the excuse that cannot be met; therefore, nothing gets accomplished and it's always someone else's fault. THEY! Folks, I'm going to fire a warning shot, which you know I never do because that can be a fear tactic, but with this being the third time this aspect has shown up for us in a month and a half, then we either 'get the get' and make changes, or you can look forward to staying in the same spot next year. Now see, that would terrify the hell out of me, to be in the same spot next year. If you are hung up on something that involves jealous, obsessive, plotting, scheming or pessimistic energy, then it is important to recognize this is either mental abuse on yourself or mental abuse on someone else. This aspect can easily create a mental bully. SNAP OUT OF IT! Use this narrow-mindedness to fix details that are important, not to focus on details that make absolutely no difference in the grand scheme of things. The day begins with two wonderful lunar aspects that involve a lot of male (testosterone) energy as the Moon trines the Sun and the Moon trines Saturn, both of which are authority and father figure energies, while the Moon is nurturing and estrogen energy. This is a wonderful time to make appointments with the doctor and do some self-care. It is also a great time to take care of anything where you will need some extra confidence. These are absolutely wonderful energies for our emotions this morning, which will last most of the day. 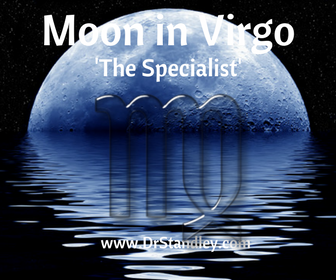 It's that last lunar aspect that wants to mess with mind and it tempt it with wine as the Moon opposes Neptune. Resist the temptation and stop telling yourself that you deserve a glass of wine, when you may be using it just to check-out. You need all of your brain and all of your imagination now. Do not check-out! Download the 'Mercury Square Saturn' chart wheel here! The Moon in Virgo trine Sun in Taurus at exactly 1:17 AM EDT. You will feel this energy within 12-14 hours 'before and after' it occurs. The Moon in Virgo trine Saturn in Capricorn at exactly 8:30 AM EDT. You will feel this energy within 12-14 hours 'before and after' it occurs. Mercury in Aries square Saturn in Capricorn at exactly 5:27 PM EDT. This aspect began on March 25th, it is exact today and it will last until May 3rd. The Moon in Virgo opposing Neptune in Pisces at exactly 8:05 PM EDT. You will feel this energy within 12-14 hours 'before and after' it occurs.